Do All Non-Orthodox People Go to Hell? What does an Orthodox Christian do when faced with the manifest godliness and piety of a heretic? Certainly the first thing you do is acknowledge that it is indeed godliness and piety. 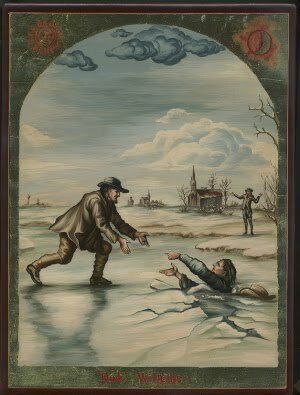 The picture on the left is a popular Mennonite image of a Mennonite refugee who, being chased across a frozen river, stops and returns to help one of his pursuers who has fallen through the ice. The pursuer is saved and the Mennonite is captured and burned at the stake as a heretic. The image is iconic of the Gospel and could easily take a place beside the icon on the prodigal son or the publican and the pharase as a faithful image of the Gospel teaching. 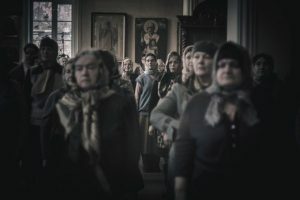 I am often asked by Orthodox teens how they are supposed to interpret their observation that some pagans and other non-Orthodox seem to be more righteous than the Orthodox Christians they know. I have an answer, but it is not very satisfying. It is already an indictment that such an observation is so commonly made. No amount of explaining really helps. 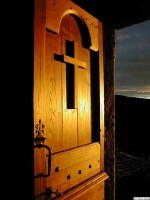 “We have found the true faith,” and yet we don’t live it.